I have permission to go ahead and add a few interesting locations for parts of Atheria. I’m still giving some thought to the Mri. Nothing here is too far out of the ordinary, but it is different and turns the regions into something slightly less homogenous. Widely known as a barbaric tribal swamp filled with misery and nightmarish creatures best left undisturbed, Chelm mostly fits that description. Nonetheless, even it has some differences from place to place. Few of the domains are completely monolithic from one end to the other. 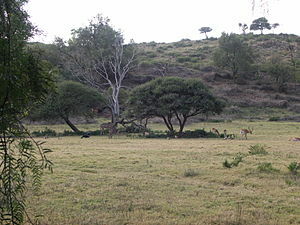 The Telemon Plateau features a drier climate because it is raised well above the surrounding land – though even it receives considerable rainfall. The plateau lies some seventy miles south of the Order border, and getting up those steep cliffs can be quite difficult. The western end is a broken cliff face between five hundred and two thousand feet high. The eastern end, however, has a much more gentle slope, with a river winding down through a series of cascades. Though they and the region once held different names, the Telemon people now dominate the area. Formerly a small city near the Imperial border, they seem to have uprooted entirely, probably happened within a few centuries of the Empire’s founding. The Telemon migrated to the plateau and built their new city, Mactlil. Mactlil sits on the border of an artificial reservoir and provides abundant fish and marsh plants. The Telemon’s militaristic society effectively exploits their resources, and they have a surprisingly high population. They use this to crush any sign of internal or external revolt and offer sacrifices of such captives regularly, forming huge temple complexes featuring dozens of built Stelae. Community purpose and religious fervor unites the people socially, if not always politically. Though bands of powerful adventurers have conquered Mactlil a dozen times over, its strong culture and pride allow the Telemon to keep their identity and unity. They have a small Imperial Embassy, and traveling back and forth on official business is safe enough – the Telemon send experienced warbands as diplomatic escorts. Few fools attack such a group, particularly with their multiple animal companions and guides. Saik is more of a simple trading post than a town, and sits on the large Matteniney lake system. It bears the dubious distinction of being tdeeper inside of Chelm than any other site which regularly trades with the Empire. Where the Telemon survive by sheer ferocity and faith, Saik is simply a common stop for numerous tribes – none of whom want to see their neighbors control it. So goods mostly manage to trickle through from the Empire and back, aided by many oaths of friendship and ample supplies of liquor. Saik itself sits on a rocky rise amidst the lake system, accessed by boat or a long series of causeways. The site itself is worthless, but it is easily reached from a number of directions. Harvesters venture out regularly to claim supplies of amber and sift for gold washed out of the hills. Additionally, the lake creatures provide a number of useful medicinal concoctions, some of which are even legal in the Empire. Saik can only claim perhaps two dozen permanent buildings, but they include some large guesthouses for passing traders. If those get full, there’s plenty of space to pitch a tent. Violence is rare even during large gatherings, as Saik is something of a sacred site and several fanatic quasi-priests offer murderers to the carnivorous fish dwelling in the lake. The souls of those eaten are supposedly doomed to be enslaved by the primal piranha spirit. Molett is a town site which forms the power base of The Umbraic Master. The pretentious name notwithstanding, the man is a potent wielder of shadow-based magic. Those tribes which dare attack and survive an initial defenses rarely take anything worth having, and usually find themselves hunted by extremely dangerous shadow creatures if they don’t flee far and fast. After a few locals got themselves massacred in this way, almost all the rest rushed to offer tribute (and claim the now sparsely populated land quickly). Travelers nearing the town report having “invitations” extended by mighty shadows which emerged from swamp; they considered the medium to be the message in this case. However, the Umbraic Master at least does not harm polite individuals, and even offers excellent hospitality for Chelm. He seems to be developing his town site to create mystical symbols for some purpose,and takes an interest in the goings-on of the outside world. This being Chelm, most assume his plans are even more dangerous than normal and he’s simply being subtle about it. Barbarians tend to fall into one of three categories based on the tribe. Some tribes are relatively settled, even if they aren’t very large. They usually dwell near a site they consider sacred or related to an ancestor or totem spirit. Others are mobile, moving back and forth between winter and summer lands. The final are semi-settled, tribes who move on every few generations in search of better land and wealth. And these are in that order the most to least peaceful: settled tribes often find warfare wasteful, though they’re no less ready to fight. Nomads tend to argue and bicker over the best land, but large wars are rare. The semi-settled tribes must fight and conquer to survive. Settled tribes tend to live more towards the south, near the Imperial border, although some do dwell near Dernmarik. Nomads mostly favor the wider, more open eastern steppe. Semi-settled tribes go as they can manage, though they’re more common in the northeast. Semi-settled tribes are the most likely to try raiding the Imperial border or Dernmarik, while settled tribes often hate these cousins. A large portion of the Inked Claw tribe recently moved near the Imperial border and settled down. This seems to be due to the younger members’ desire for more wealth, and they are using their considerable acumen to trade with the Empire. While they haven’t adopted Imperial culture, they have used Imperial materials in their own crafting. This Fox-totem tribe seems to have an inordinate love of fine cloth for some reason, and trade away the gold jewelry of many barbarians in favor of fashion. Imperial traders find them convenient, since the Inked Claw are a lot less primitive than most Totemists and therefore much more pleasant to deal with. They’re expert craftsman, though Imperials find their social order dizzyingly complex and quite opaque. The Gallerk tribe and Great-Axe-of-Kalo tribe landed near the Dermarik border about twenty years ago. While they do tend to move every generation or three, these Wolf and Bear-totem tribes don’t migrate according to season or hunting. In fact, they farm and raise animals, though it hasn’t particularly hurt their ferocity or love of battle. While the two tribes have their own traditions, they found it convenient to band together and often send out mixed warbands. They are apparently conflicting with the new Free City of Stormfist, an argument started over some runaway slaves despite the intervening distance. Life Attunement cultures tend not to have large population concentrations: they simply don’t need them – and have a hard time finding the water to support them. They’re so individually tough that feuds are common but deaths rare, so defense is rarely an issue. The nature of the plains offers a wealth of food, whether you follow herds, keep some livestock, or trade for your meals. Fine craftsmanship is prized, but tends towards the personal: Life attuned people may buy the odd Imperial import, but tend to disdain any kind of commonplace, mass-made item. Sure, those items exist, but only the poor would be happy with such goods. Helping this is the nature of life-attuned animals. Almost any animal product is easily obtained in quantity, and half the time the animals don’t even object. Sheer a sheep and it probably grows the wool by the time you finish. And the docile, cowlike Hoofers* merely look at you confusedly if you walk up and tear off a flank or two – and then go back to grazing. The easily-harvested meat makes for tender vittles and forms a major part of the local diet, so that towns are spread out, with each family owning a little grazing and some meat-to-go. Rather than dig for metals, they usually harvest dead beasts from certain species with extremely tough bones. Nonetheless, even here there are some powerful population centers. The Garachin actually live on both sides of the Chelmian border. Why exactly they landed there is a mystery, but the various Blood, Life, and Shadow attunements seem to get along quite well – political factions are organized by ancient bloodlines and personal charisma and not attunement. As such, they’re fairly cosmopolitan and very proud. The ancestral founders of Garachinseem to have come from the Life-attunement lands, and the normal Chelmians utterly refuse to use Stelae, considering them to be unholy abominations. Garachin is in a perpetual state of slow guerrilla war with Chelmian tribes, but this hasn’t changed in centuries and isn’t likely to now. The Free States are a mixed lot of small city-states in the south-west. These cities rarely number more than a few thousand souls, and the borders constant flex back and forth with the (bloody but often casualty-less) fighting. Conquests are rare, because each city has its own laws and society, and any centralizing power would soon face a huge alliance against it, partly through fear of conquest and partly because it would have to massacre huge portions of the (very much intermarried) noble houses). The most successful Free State is The Perfect, ruled by the (ahem) Perfector, Garrick Asorn. A truly incredible warrior, Garrick takes to the field personally leading his forces, and collecting huge tribute from the surrounding states. The wealth pouring into The Perfect has made it into a much larger city, reaching a height of over 50,000 people. An ugly war may be brewing, because while food isn’t a problem, The Perfect needs water which can only be gotten from building aqueducts or canals through neighboring territories. We’ll close by stating that many other sites and oddities exist. It’s a world, after all, and may not even be totally explored yet – and if it is, then it’s hard to communicate even part of that length.